Kim Kardashian was first in line to congradulate her boyfriend, Reggie Bush, after his team New Orleans Saints won the NFL Super Bowl yesterday. Twitter went crazy with NFL tweets. I for one have no clue to the rules of American football. I didn't even realise who was playing until some of my friends on Twitter kindly took the time to explain the rules of the game. Reggie's winning team, New Orlean Saints beat the Indianapolis Colts at the Sun Life Stadium in Miami. 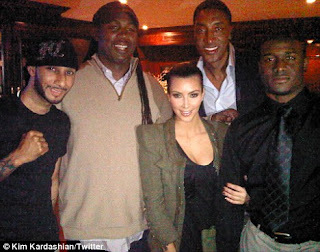 Unlike the NFL wives who wore jerseys with their hubbys/boyfriends football team, Kim went the other way (thank goodness!) and decided to keep it simple yet sweet with jeans, heels a black top and blazer. Apparently she is superstitious about wearing the team shirt. Well done Saints!